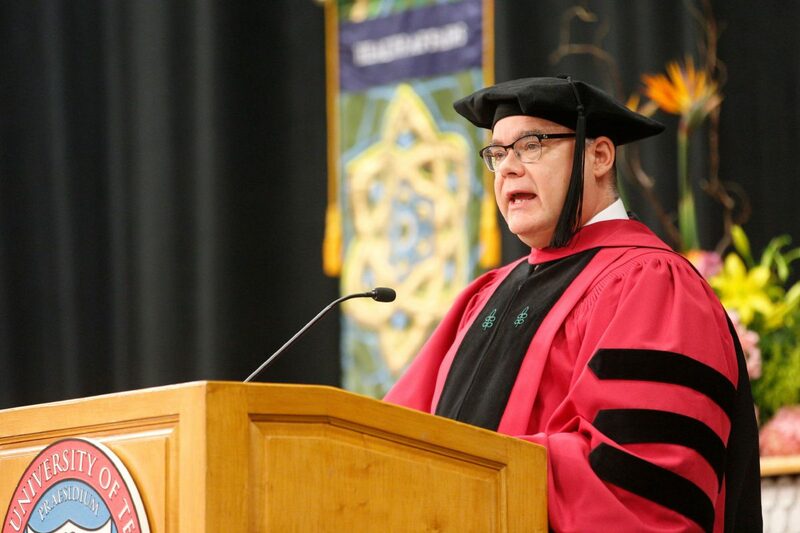 Dr. John Krouse, executive vice president for Health Affairs and Dean of the School of Medicine, delivers remarks during one of the University of Texas-Rio Grande Valley commencement ceremonies on Saturday in McAllen. McALLEN — More than 2,000 prospective graduates moved their tassels from right to left to signify the completion of their degrees, during the second day of UTRGV’s Spring 2018 Commencement ceremonies on Saturday. Patricia Alvarez McHatton, executive vice president for academic affairs, student success and P-16 integration, who led the ceremonies, enthusiastically congratulated the Vaqueros on their special day. More than 2,000 graduates walked across the stage during the second day of UTRGV’s Spring 2018 Commencement ceremonies, Saturday, May 12, at the McAllen Convention Center. 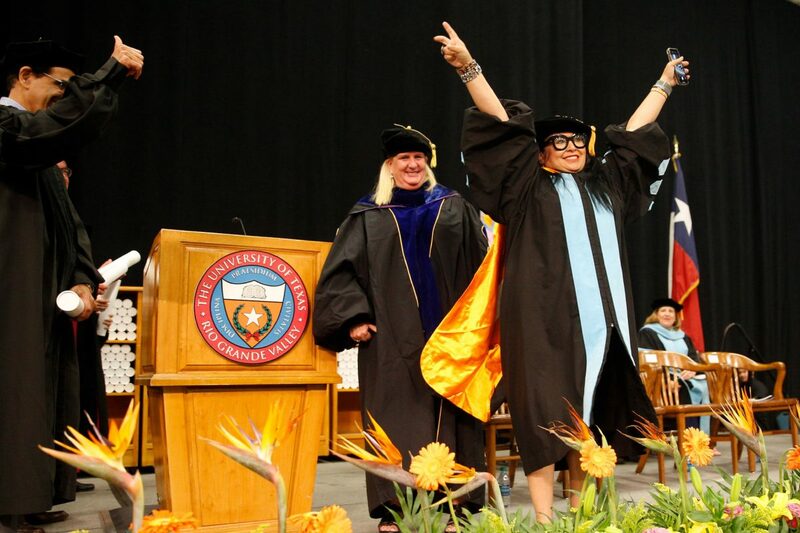 Here, Dr. Maria Edith ‘E.T.’ Treviño, EdD, of Weslaco, celebrates conferral of her doctoral degree in Curriculum and Instruction with specialization in bilingual studies, with a V’s up followed by a quick victory dance onstage. 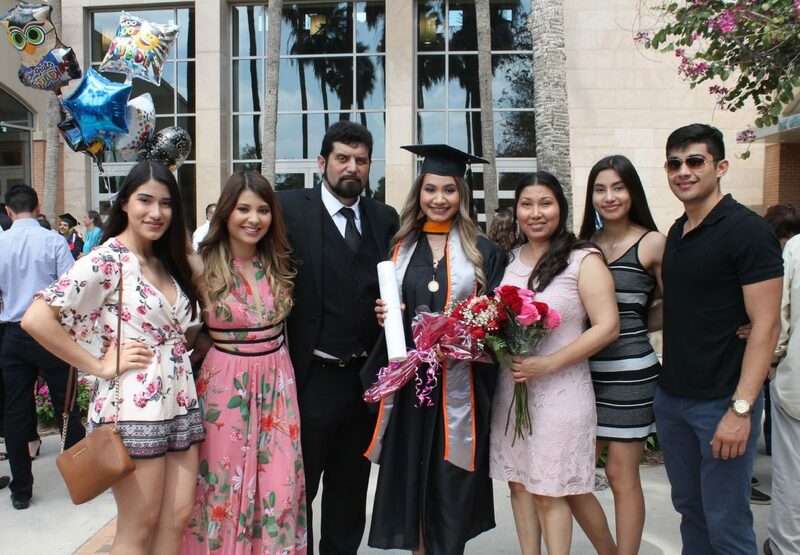 Cheering her on from the audience – ‘That’s my mom!’ – was her daughter, Alexia Treviño, who was graduating during the same ceremony with a Bachelor of Science degree in Nursing. Family of Jacqueline Garcia pose for photo after the UTRGV Commencement Ceremony at the McAllen Convention Center in McAllen. 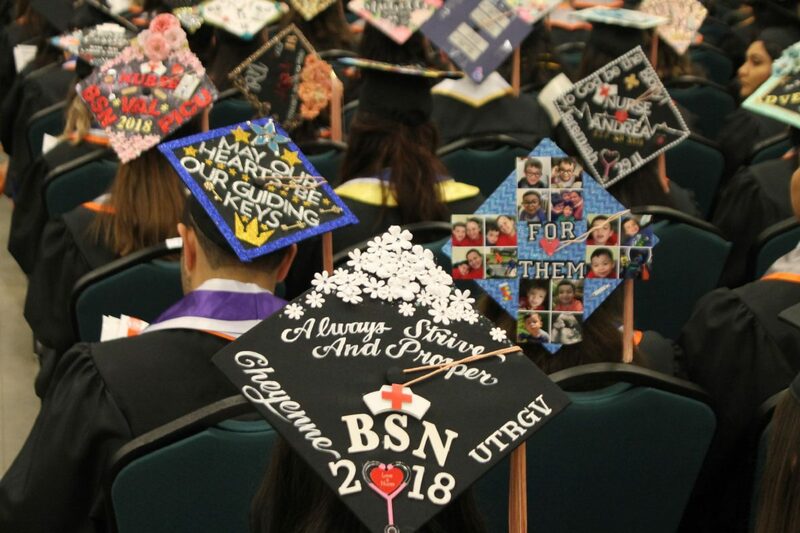 An array of soon-to-be graduates all decorated their caps for the special day at the UTRGV Spring 2018 Commencement Ceremony at the McAllen Convention Center in McAllen. A soon-to-be graduate smiles as she is getting her photo taken at the UTRGV Spring 2018 Commencement Ceremony at the McAllen Convention Center in McAllen. 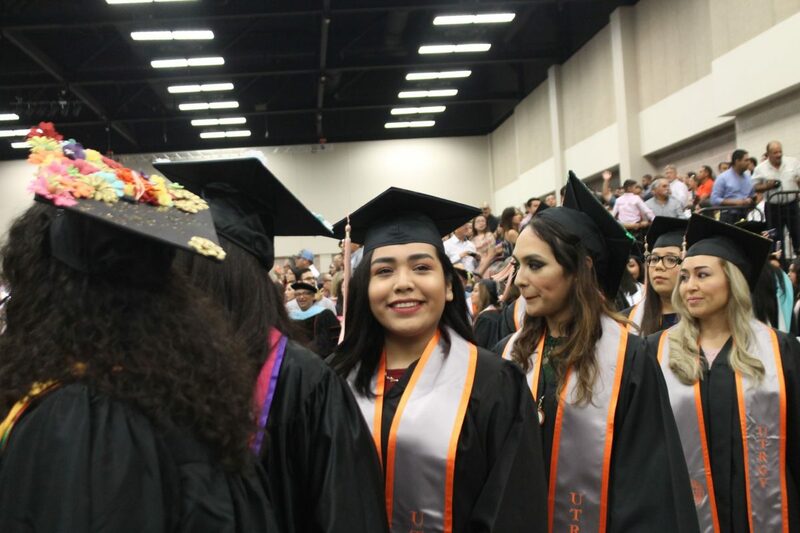 Between Friday’s ceremony in Brownsville, which included more than 700 graduates, and Saturday’s ceremonies, UTRGV graduated more than 3,100 students. “Use everything that you have learned at UTRGV to make your community and nation a better world for humankind,” he said.